Try not to panic, but there is now less than two weeks until Christmas. Do you have your holiday shopping done? Visit Hendricks County&apos;s guide to one-of-a-kind gifts is super helpful to holiday shoppers, and as I&apos;ve been making my way around Hendricks County to get my own shopping done, I&apos;ve come across some additional unique gift ideas that I&apos;d like to share with you. On Dec. 11, Indiana officially turned 200 years old. 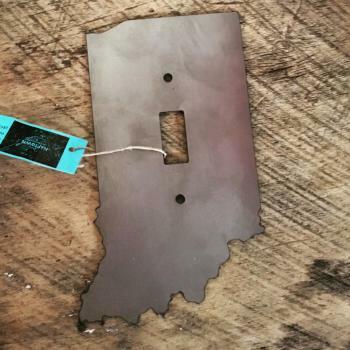 We&apos;ve been celebrating Indiana&apos;s bicentennial all year long, and a great Hoosier-themed holiday gift for those on your shopping list is an Indiana-shaped light switch cover or keychain. These "Made in NAPTOWN" ornamental metalwork gifts are fabricated in Indianapolis and available at Tiffany&apos;s Boutique in Avon. The light switch covers are $18 a piece, and the keychains are $10 each. A great gift for the foodie or sweet tooth on your shopping list is basically anything created by Jenny Wren&apos;s Cookies & Confections in Danville. Order some homemade cookies, chocolates, cinnamon rolls and more for Christmas parties, family get-togethers or gifts over the holiday season. You can also give the early Christmas gift of a fun experience at Jenny Wren&apos;s Cookies & Confections -- a cookie-decorating Elf Workshop. Available at 6 p.m. on Dec. 14, 2 p.m. on Dec. 18 or 6 p.m. Dec 21, the Elf Workshop provides kids and adults the opportunity to decorate two large cookies, learn a little elf magic and enjoy a few additional surprises. The Elf Workshop is $10 per person and can be arranged by contacting shop owner Jennifer Cline through this Facebook event. 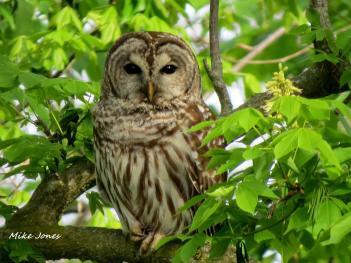 This one is near and dear to my heart, as I work for Hendricks County Parks & Recreation. Over the summer, we held a photography contest to create a 2017 wall calendar, and we received 362 absolutely fantastic photos taken in McCloud Nature Park in North Salem and Sodalis Nature Park in Plainfield by local amateur and professional photographers. We chose twelve photos to feature in our first-of-its-kind wall calendar, and now you can experience a new breath-taking view of nature in Hendricks County every month in 2017. You&apos;re also helping a good cause when you purchase a calendar because all proceeds go toward improvements to McCloud Nature Park, Sodalis Nature Park and the Amo-Coatesville section of the Vandalia Trail. Wall calendars are available online for $10 each through the Parks Foundation of Hendricks County&apos;s website by clicking here, or you can pick one up at our main office located at 955 E. Main St. in Danville from 8 a.m. to 4 p.m., Monday through Friday. 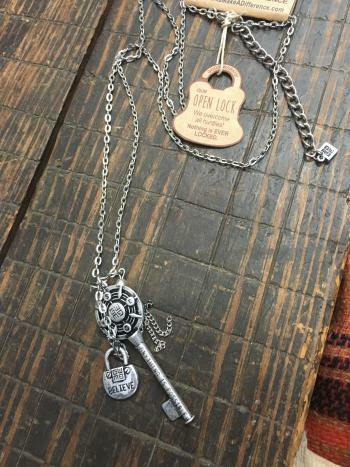 Good Works Blessing Keys are not only attractive, uplifting and inspirational necklaces and bracelets, they also benefit others. The company that makes these pieces of jewelry donates 25 percent of its net proceeds to charitable organizations! Good Works Blessing Keys necklaces and bracelets are available at Sweet M&apos;s Boutique in Plainfield. Necklaces are $26 each and bracelets are $13 a piece. You can find all sorts of tasty baked goods, soups, salads, sandwiches and treats at Grandma&apos;s Oven, located in The Shops at Perry Crossing in Plainfield. Did you know that you can also find all sorts of great holiday gift ideas there, too? One example is Gert&apos;s loom rugs -- handcrafted by a Hoosier elementary school art teacher and made from recycled clothing. Constructed mainly from denim and Oxford shirts, these loom rugs are both attractive (pictured at the top of this blog post) and durable. A 40-inch rug goes for $36, or purchase a 47-inch rug for $40. Where have you found some excellent holiday gifts? Comment below and let us know!